Bacardi and Lonely Whale hope to drive a cultural conversation about straws in real and digital life. The final resting place for most plastic straws is the ocean, where they can be deadly to turtles, sea birds and fish. That’s why some major brands, including Starbucks, have been considering doing away with plastic straws. Now there’s a brand that’s looking to cut plastic straws from an unexpected place: emojis. 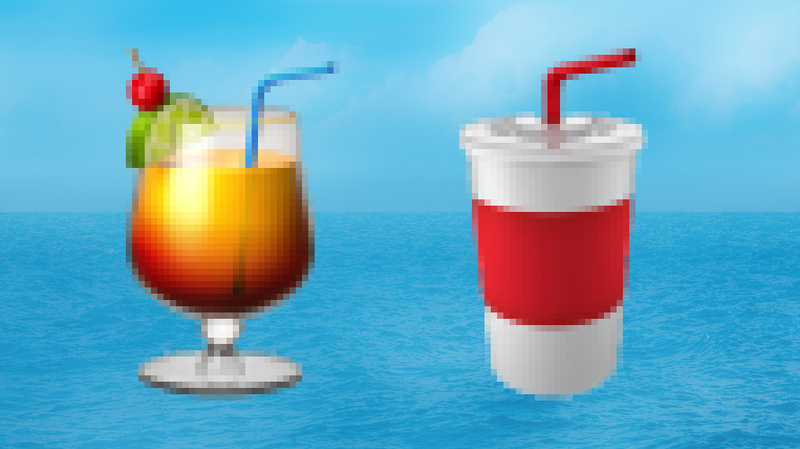 Timed with today’s celebration of World Water Day, Bacardi Limited has sent a “cease and de-sip” letter to the Unicode Consortium, urging the body to remove emoji straws from soda and mixed drink emojis. This letter speaks on behalf of Sydney, a sea turtle that wants a better habitat for herself and fellow ocean dwellers. 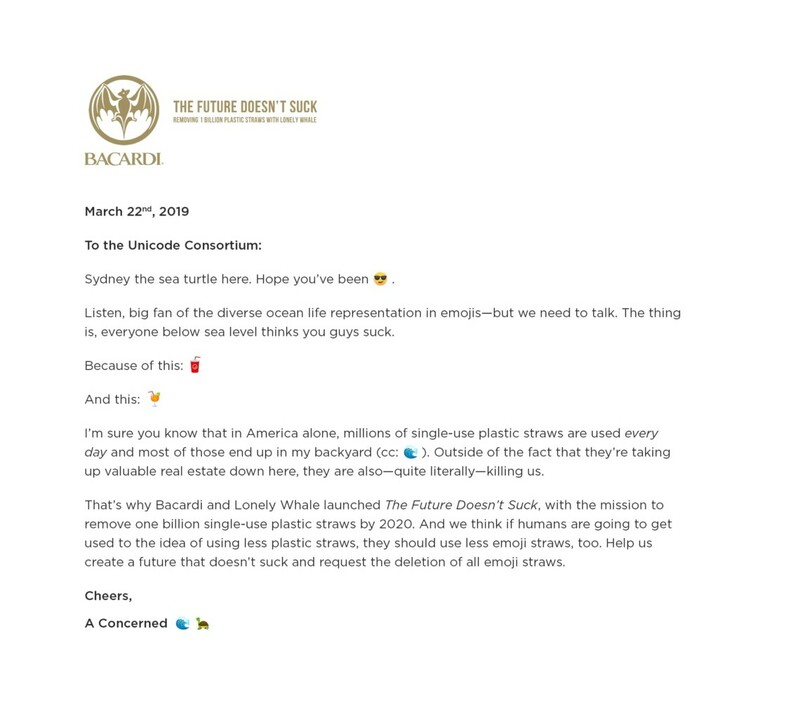 Bacardi teamed up with environmental group Lonely Whale to eliminate 1 billion plastic straws by 2020 with #TheFutureDoesntSuck. Actor Daniel Franzese, known for taking on “The Plastics” in Mean Girls, is taking on another form of plastic by serving as Sydney’s spokesman in a video where he reads Sydney’s letter urging the consortium to remove straw emojis. In addition to the video and letter, created by Day One Agency, Bacardi and Lonely Whale also launched collection of Giphy stickers, created by Diana Pietrzyk, showing plastic straws vanishing. “We hope that as we urge Unicode against including digital straws, consumers will sign #TheFutureDoesntSuck pledge to help us remove real plastic straws,” said Dune Ives, executive director of Lonely Whale. An unrelated campaign by Greenpeace Canada last year drove this message home by showing pictures of fish, turtles and seagulls with straws down their throats, illustrating how single-use plastics like straws can wound and kill sea life.